There is also a version for fanfare orchestra, Op. 81. This composition is a crowd funding project. I also wrote a version of it for fanfare orchestra, and for € 150, you and / or your orchestra can become one of the commissioners of either version: you will then be mentioned in this preface to the score as a co-commissioner. If you feel like participating, please contact me at hallo[at]eduarddeboer.org. Premiere performance by the Banda Asociación Amigos de la Música de Yecla, conducted by Ángel Hernández Azorín, Sunday April 8, 2018 in the Auditorio Victor Villegas, Murcia. The total of these musical ‘ingredients’ led me to write a composition with a rather simple, but at the same time dark and menacing atmosphere. After a relatively slow introduction, the music becomes ever fiercer in a series of successive waves, until a climax is reached, culminating in a few bars of solo percussion. 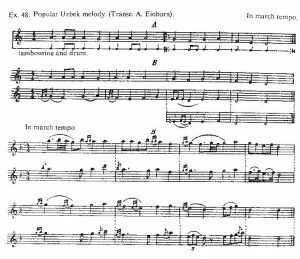 This is followed by a lamenting variant of the march theme, after which the composition reaches a stark conclusion.